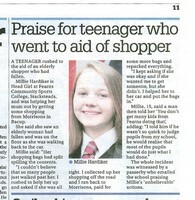 This would have ordinarily been a Good Samaritan story however it developed into much more when, even though 15-year-old Millie was helping a pensioner, a man chose to criticise her school. 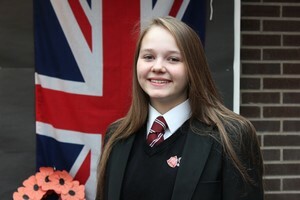 Head Girl at Fearns Community Sports College had done what other passersby failed to do in helping the elderly lady who had fallen and her shopping bags had split spilling the contents everywhere. Thoughtful Millie rushed to help, bought new bags and repacked the shopping and then escorted the lady back to her car. That is when a man decided to begin putting her school down. However he met his match in Millie. She calmly answered every criticism and put across her point of view succinctly until, she admitted, it seemed he could not wait to get away. Her story was used by the Rossendale Free Press and shared more than 450 times. 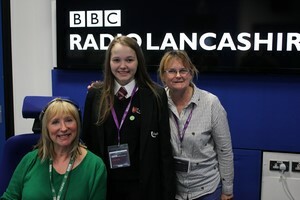 I also arranged for her to be interviewed live on BBC Radio Lancashire on the Sally Naden mid-morning show. Apologies for not updating this site sooner – please keep up to date with all my news by liking Facebook page Catherine Smyth Media. As mentioned in my August blog, I was kept very busy writing case studies for Rossendale Borough Council. Here they are all on the new Invest In Rossendale site. I also covered the visit of Piers Linney to launch the website and support. The story was used far and wide, in the local press and business media. My testimonial work for M3 Project provided the charity with invaluable insight into how the service has helped and how it can develop in the future. Here is one of the stories. More Fearns news – I took three pupils to London for the prize of a workshop at the TES Group, Times Educational Supplement. What an amazing opportunity, I have also covered languages day, Year 6 taster day and a Diana citizenship award. Haslingden High School has been in the news for sporting achievements with swimmers hopefully earning a place in the English schools final, horse rider Daisy winning silver a European competition along with bookworm Theo and fundraiser Ben. A Whitworth Community High School teacher and his family spent their summer in Uganda running a workshop, musician Alice hit he headlines for playing in eight bands and Isabel took her GCSE two years early getting Grade 8. The latest JJO Journal was produced along with newsletters for Veterans In Communities. At VIC I also wrote about a visit of the High Sheriff of Lancashire to the centre and a fundraising ceilidh. More ad hoc work has come in including for Dementia Friendly Rossendale, Citizens’ Advice, Bacup Pride Flowerpot Festival, Stacksteads Countryside Park Group’s Light Up the Valley Lantern Procession, Bacup Natural History Society Heritage Lottery grant, Winter Solicitors, author Alistair Chapman, St Joseph’s Football Club, two stories forÂ Dansworks Dance Academy and Therapy Counselling Services. Phew. Links are to the stories. Another unusual piece of work involved me interviewing Denise Beddows the author of a new book on a 70-year-old Rawtenstall murder. In 1948 Maggie Allen murdered Nancy Chadwick – it was a full house with standing room only and was very well received. i did a lot of research for this interview scouring copies of the Free Press from 1948 and 9. Alongside completing work on Ribble Valley Business Awards and Rossendale Business Awards, I was delighted to be nominated both for my business in the Valley at Work award and for Enterprising Woman. Thank you to my nominee. Tonight I will cover the final presentation at Stirk House in Gisburn for Ribble Valley Business Awards and in November it will be Rossendale’s presentation. Tomorrow I complete the third edition of The Heights Free Press and on Monday I will be back at Coal Clough Academy in Burnley to produce issue six of Coal Clough News. Two after school clubs at Northern and Britannia Primary Schools are also working hard to produce their Christmas issues of their school newspapers. Thank you to everyone who has employed me so far this year.